"The United States of America is a Christian Nation" - Demagogue, politician, and self-avowed Christian. Is it? If it meant that Christianity has the largest self-avowed adherents among all religions, then, yes, this is a true statement. 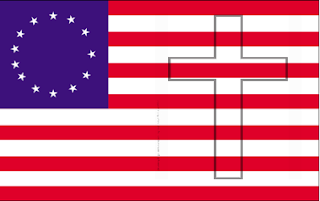 Slightly more than three in four Americans claim to be Christian, so one can easily call the USA a Christian Nation. Likewise, we can also call it a Caucasian Nation. But you do not hear that claim as often. Since the claim is often elaborated to mean that America was founded on Christian principles, what they really mean is that Christianity is the foundational basis of our nation. That, is a separate claim, and is what I'll address here. Therefore it is obvious that the founders founded the country to be governed by Christian principles. Each time this happens, a fierce debate ensues, with quote-mining showing that some or most of the founders were not Christian, but deists perhaps. It goes nowhere. Fast. When in the Course of human events, it becomes necessary for one people to dissolve the political bands which have connected them with another, and to assume among the powers of the earth, the separate and equal station to which the Laws of Nature and of Nature's God entitle them, a decent respect to the opinions of mankind requires that they should declare the causes which impel them to the separation.We hold these truths to be self-evident, that all men are created equal, that they are endowed by their Creator with certain unalienable Rights, that among these are Life, Liberty and the pursuit of Happiness. See, it says God, therefore [magic, in lieu of deduction goes here] Jesus! Yes, a non sequitur and a non-starter. Lastly, a special meaning of the First Amendment is divined, proclaiming we have freedom of religion but not freedom from religion, [magic in lieu of deduction goes here] therefore we are under the covenant of Christianity. It is also absurd, given that the only relevant clause in the Constitution regarding religion says nothing of Christianity and explicitly grants both freedoms; and given that while the First Commandment requires one to acknowledge Yahweh asyour only or at least your first god, the First Amendment explictly allows one to have any and even no god. To end it here would be no fun though. So to start off, I'll stipulate that most of the founders were self-avowed Christians, it adds no value to bicker on this. I shall then demonstrate that even with that stipulation, one cannot logically arrive at the conclusion. More on that in a minute, but something bothers me about these claims, and I wonder if it does the Christians too, who assert that we are a Christian Nation. I have read the Bible, and find that it has copious references to Yahweh and Jesus. Verse after verse, there is no escaping that. Yet, I find that pattern absent in both the Declaration, and the Constitution. In fact Jesus is never mentioned directly even once in either document, and God only in the Declaration, that too with a qualification of Nature's or more obliquely, as Creator. Christianity is not mentioned at all. Heck, the King of England features more prominently than the central object of Christianity! At least they were clear about Texas being for white men, and themselves to be a Christian nation, who by divine decree could enslave the Africans. To be complete, there is a reference to "the Lord" in the Constitution. But that was simply to date the document, as in "the Seventeenth Day of September in the Year of our Lord one thousand seven hundred and Eighty seven", which obviously is no more an endorsement for the Lord being glorified than the months of the year are, for being named after Roman emperors. Would you, as a Christian who founded a nation and wanted to have Jesus as the head of the state, leave out glorifying him so completely? Wouldn't you at least mention Christianity or Jesus in that document? Would you start a Christian church without the cross displayed anywhere on the property? Why then did Christian founders, who supposedly founded the USA on Christian principles, so callously and carelessly leave out, not just mentioning Jesus repeatedly, but altogether! Maybe they were doing what Jesus would do, when they declared independence from England. Let's examine it from that perspective. Most Tea Party members, or at least some people since January 21, 2009, have revolted against taxes, claiming parallels to the 1776 revolt—taxation without representation. (It is another matter that they have representation, and also the ability to change that representation.) But it is correct that the founders revolted against taxation without representation, among other things. What would Jesus have done? Well, the Bible offers us a hint. In Jesus's time, the Roman emperor had the Imperial Tax. It was a tax on specific subjects (like Jesus's people) and in Mark 12, you have them asking whether they should be paying Caesar his tax. Not armed conflict, not rebellion, but basically, pay the man! Clearly what the founders did under similar circumstances was completely different than what Jesus advocated. The last nail in the coffin—on Biblical grounds alone—comes from a simple extension of the argument. If the nation can be said to have been founded on Christian principles because the founders were Christian, then it logically follows that those very same Christian principles condone slavery. After all, many of those founders, Christian and all, possessed slaves. (There are other ways to establish that Christianity was used to justify slavery, but that is not the point here.) Most importantly, unlike the (non-)mention of Jesus, the notion of indentured people is in the Constitution. Not allowing women to vote, is likewise condoned by Christianity. Further, if most founders were meat eaters, we should likewise conclude the absurdity that America was founded on carnivorous principles. So as you can see, the argument based on "most founders were Christians" fails on just Biblical grounds. The Bible wants you to glorify God/Jesus, and neither the declaration, nor the Constitution even mention Jesus. The Bible wants you to be Christ-like. Jesus was fine with paying Caesar his taxes, not have representation, and certainly not rebel against him with violence. The founders were not. To reject that, you must at least accept that the same argument also makes it clear that Christianity condones slavery. What about non-biblical, i.e, legal grounds? There it is a non-starter given that the law of the land, the Constitution, is silent about Christianity, even as it mentions the judicial, legislative and executive branches, with the respective heads. Would a Christian nation fail to anoint Jesus at the head of the hierarchy? Just so that I can avoid discussion with incurious people who have not read this far, please use the word Calvinist inconspicuously in your first responses and queries. Now, if only we had a legal document like a bill, a treaty, or a law, formulated by the founders that said something like "THE USA IS FOUNDED ON CHRISTIAN PRINCIPLES", this would be easy, wouldn't it? 1797 would be when most of the founders were still alive and involved in confirming that treaty; therefore it should be taken as the most authoritative document for concluding that the USA was not founded on Christian principles. The doctrine of total depravity from Calvinism is the total pretzel-logic noose that prevents one from escaping the insanity spiral of Christianity once indoctrinated. That is one basis for the deep fear people who claim to be Christian feel when asked about their spiritual affiliation. People in America don't claim to be Christian because they have a relationship with God/Jesus. It is because they are not willing to deal with the shaming argumentative zealots who are sure it is their duty to badger people who don't believe, telling them they'll go to hell and worse if they don't commit fully to zealot's religion. This deep fear is what drives the rabid religionists to claim the USA was founded on "Christian Principles." That is in no way to be construed as an apology for those people. What they do is immoral and what the teabaggers are claiming about this being a Christian Nation is just continuance of the brainwashing techniques that have worked so well. I think that this myth was created sometime around 1954. Roman Catholics, the Knights of Columbus, Calvinists and other Protestants decided that it was right and proper to be a Christian nation primarily in response to the USSR's explicitly anti-religious regime. In short, as a part of the Red Scare. Before that, the only mention I've even seen of Jesus or Christianity in government was during the Civil War, and there in the form of a raging theological... erm... "debate" as to whether Jesus wanted white people to enslave Africans. And then, it was the OPPOSITION to the current US government, the Confederacy, that utilized such rhetoric. I do find it amusing that the majority of this nonsense comes from a geographical region who explicitly wanted to have a DIFFERENT government in the 1860's.